Apple News, an ambitious news-reading app that's new to iOS 9, is already showing off exclusive original content to early adopters of the latest software for iPhones and iPad, demonstrating Apple's serious intent to woo both readers and publishers with a captivating medium for the written word. Apple News is a new app in iOS 9 that presents continuously updated news and features from "top news organizations and indie publications," allowing readers to follow specific news sources or subjects and categories ranging from business, tech, sports, fashion and politics. Readers can explore featured content or search for news on specific events or topics; the new app then refines relevant suggestions based on the user's interests. 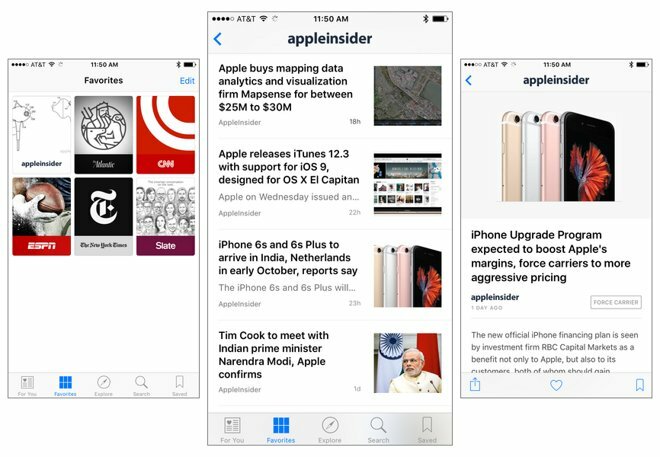 Apple News readers can, for example, easily add AppleInsider content to their news feeds to stay up-to-date on all things Apple. For content creators, Apple has developed a publishing system for Apple News to facilitate stylish, dynamic page layouts incorporating custom typography, galleries of images, embedded video and interactive animation. Readers can bookmark or save content for later, or share articles with others via email, Messages or social networks including Twitter and Facebook. 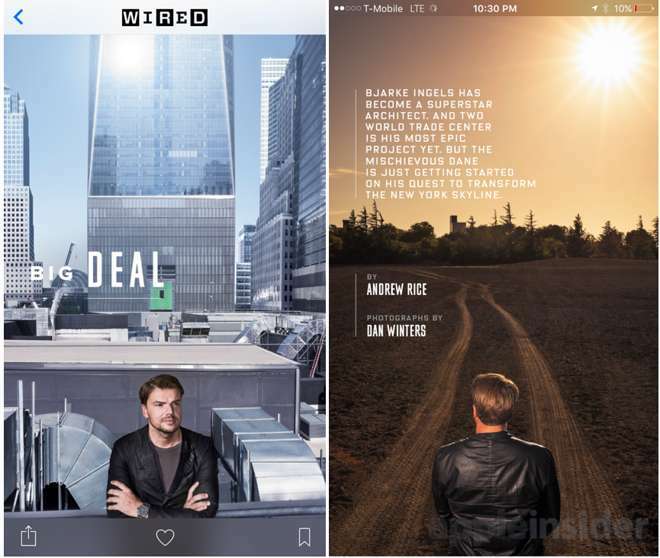 Despite iOS 9 being only a few days old, Apple has already started lining up exclusive content, including an in-depth feature on star architect Bjarke Ingels Group (BIG) written by Andrew Rice for Wired. 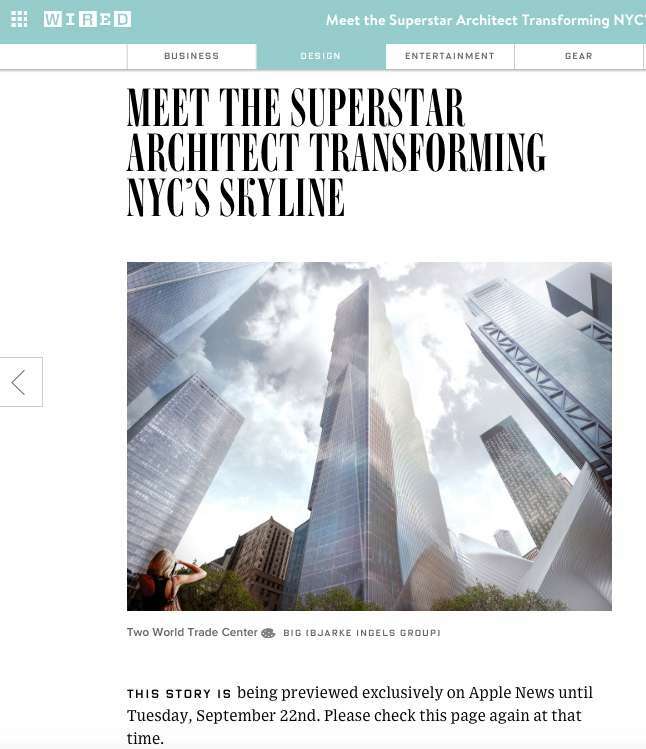 The article details BIG's efforts to design the dramatic new $4 billion World Trade Center 2 skyscraper in New York City, challenged by requirements ranging from client needs (including its anchor tenant, the offices of Rupert Murdoch's 21st Century Fox and News Corp) to safety regulations (necessitating heavy bomb-resistant glass) and existing site realities (including the massive mall and transit center being built below the site by Santiago Calatrava, along with a foundation designed for an earlier skyscraper of a different design by Norman Foster). "This story is being previewed exclusively on Apple News until Tuesday, September 22nd. Please check this page again at that time. To view this story in the Apple News app on your iOS 9 device, follow this link: https://news.apple.com/A-oPQmJNfTyi9oHKs1xCY3w." Just three days after the launch of iOS 9, Mixpanel reported that an incredible 36.7 percent of the installed base it monitors has already installed the new software. In comparison, Google currently reports that only 21 percent of its active Android users have obtained some version of Android 5.0 Lollipop since it first became available nearly a year ago. Other features ranging from Apple Pay and Touch ID authentication to Apple Maps and Passbook (now know as Wallet in iOS 9) have similarly seen rapid, enthusiastic adoption from developers and merchants seeking to reach the company's valuable demographic of iPhone and iPad users.